How do we define greatness in science? I started pondering this question after responses started coming in to Nature Chemistry‘s “unscientific & arbitrary Twitter poll“, asking “Who is the greatest chemist of all time?” The results are now posted on The Skeptical Chymist, the Nature Chemistry blog. My opening question was sparked by a particular name on the list: Fritz Haber. Even if you’re not a chemist, you might have heard of Haber in a general chemistry course. A German chemist, Haber is most widely known for the reaction that bears his name, the Haber or Haber-Bosch process, the first method for synthesizing ammonia from nitrogen and hydrogen gases. It may seem trivial now, but at the time, chemists had been trying to do just that for over a century. Haber and collaborator Robert Le Riossignol found that under high pressure and high temperature, the gases would react to form ammonia. The formation of ammonia was still quite slow, but Haber and Le Riossignol subsequently discovered that the rare metal osmium accelerated the reaction. with industrializing the process. Being a rare metal, osmium was expensive and its supply limited. Mittasch tried 4000 catalysts and found that a mixture of iron and metal oxides, a much cheaper and more abundant alternative, could be used. The first industrial unit fired up in September 1913, generating up to 5 tons of ammonia every day. would be ineffectual on the frontlines, Haber recommended using chlorine gas to flush enemy soldiers out of the trenches. He committed to turning this idea to reality, even though it was in direct contravention to the Hague Conventions. He oversaw every aspect of the effort–manufacturing, testing, installation. The first test on the frontlines came at the second Battle of Ypres, ushering in a new era of warfare. Over 150 tons of chlorine gas were released within 10 minutes in each of two deployments in two days. The result: 15,000 casualties with 5000 dead, including many German soldiers because gas masks did not reach the front prior to the attack. Haber continued to develop chemical warfare agents and tactics. He was not dissuaded by the suicide of his wife, who considered chemical warfare barbaric (although it’s unclear how much Haber’s work contributed to her suicide).It seems Haber hoped that chemical warfare would bring a swift victory, and thereby an early end to the war. Instead, by the end of the war, both sides were using chemical weapons, contributing to more than 90,000 deaths and over 1 million casualties. Yet even after the war, Haber continued to oversee development and production of chemical agents. 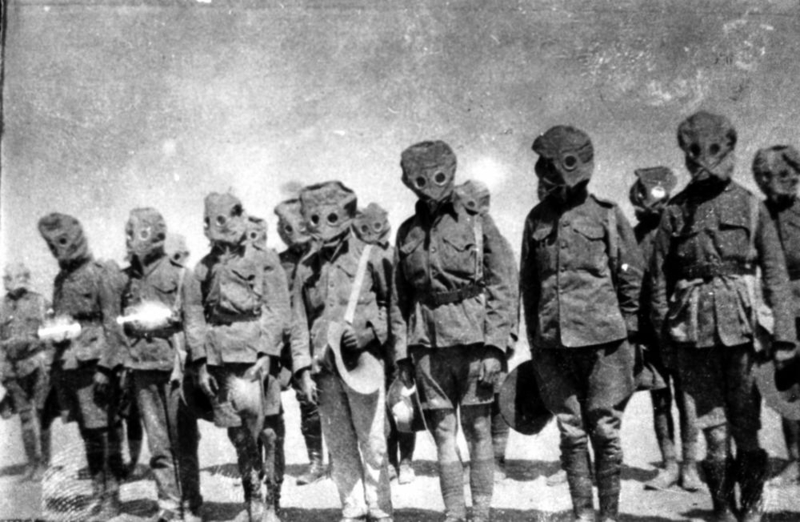 Soldiers drill in their gas masks during WWI. Photographer, unknown. Image from State Library of Queensland. Haber’s war contributions was at the center of the consternation surrounding the 1918 Nobel Prize in Chemistry (which was not announced until 1920). Here stood a man who months before had been labeled a war criminal (although the charges were dropped), now being lauded for his scientific prowess. The Prize was awarded for “the synthesis of ammonia from its elements“, and the committee highlighted the importance of this accomplishment to agriculture. There was no mention of the use of ammonia for making explosives or of Haber’s campaign for chemical warfare. And this brings us back to the question: What makes scientists great? Do we consider primarily their greatest scientific contributions? The brilliance and creativity that brought them to the answer for a long-held question, a solution for a problem plaguing the field? Do we focus solely on how their science benefited society? The boom of human population growth in the last half of the 20th century would have been unsustainable without the Haber process. The staggering rise in world population over the second half of the twentieth century was supported in part by the Haber-Bosch process. By one estimate (illustrated in graph above), in 2008, almost half the world’s population was sustained by agriculture dependent on fertilizer made from Haber’s ammonia. By a terrible irony of fate, it was his apparently most beneficent invention, the synthesis of ammonia, which has also harmed the wold immeasurably. Without it, Germany would have run out of explosives once its long-planned blitzkrieg against France failed. The war would have come to an early end and millions of young men would not have been slaughtered. In these circumstances, Lenin might never have got to Russia, Hitler might not have come to power, the Holocaust might not have happened, and European civilization from Gibraltar to the Urals might have been spared. Some shell cases on the roadside in the front area, the contents of which have been despatched over into the German lines. Photographer, Tom Aitken. From the National Library of Scotland. Nonetheless, we should not ignore the dark side of science and its practitioners. How should our perception of the morality of scientists’ actions affect the laud of their work or their standing as the greats of science? Setting aside Haber’s motivation for making ammonia, he had a very good idea of what he was promoting when he began developing toxic gases and delivery methods. But what of the brilliant minds involved in the making of the atomic bomb? Do we more readily overlook the “sins” of scientists if, later in life, they expressed remorse over their contributions to death and destruction? Do we excuse culpability because we consider a cause just? Is it the level of involvement–whether a scientist was active, complicit, or simply stood by and did nothing–that affects our perspective? Haber’s synthesis of ammonia for fertilizer was an extremely important discovery, but unlike relativity, it did not tak a scientist of unique genius to conceive it; any number of talented chemists could, and no doubt would, have done the same work before very long. I suspect the same would hold true for chemical warfare. If it hadn’t been Haber, it would have been someone else. And Allied forces responded with similar tactics in turn. Neither point dims Haber’s reputation as the father of chemical warfare, though. Moving beyond the questionable and destructive work of the great scientists, what of some of the more eccentric ideas or less rigorous investigations of famous scientists? How do these alter our concept of greatness? Haber was one of many who spent years trying to extract gold from seawater. Linus Pauling, one of the greats but not without his flaws. Photograph from the Smithsonian Institution Archives. Or consider, as Neil Withers pointed out, Pauling’s promotion of vitamin C as a health remedy. As Perutz noted in an essay on the subject, “It seems tragic that this should have become one of Pauling’s major preoccupations for the last 25 years of his life and spoilt his great reputation as a chemist.” It is worth noting though that Perutz still considered Pauling the greatest chemist of the century, in spite of this failing. Others may feel that great scientists should not have such weaknesses, but I find it easier to pass over these more innocuous shortcomings. In my mind, such idiosyncrasies remind us that these legends were indeed human and, thus, flawed. They also provide cautionary tales of how even the brightest minds can fall into trap of searching for the answer they want to find, rather than the answer the data yield. These questions are hardly new. But as we consider who the greatest individuals in our field might be, we would do well to contemplate not only their magnificent achievements but also the things that are sometimes hidden in their long shadows. Perutz, M. F. “Friend or Foe of Mankind?” and “The Battle Over Vitamin C” “What Holds Molecules Together?” in I Wish I’d Made You Angry Earlier: Essays on Science, Scientists, and Humanity. Cold Spring Harbor, NY: Cold Spring Harbor Laboratory Press, 2003. *Where possible, I have listed primary sources of images in their captions. Original digitized versions may be accessed by clicking on the desired image. This entry was posted in conduct of research, ethics in science, history of science, humanity, responsibilities and tagged Chemistry, Ethics, History. Bookmark the permalink. There’s a book that recently came out about Haber and Bosch called “The Alchemy of Air” which is pretty good. Thanks 🙂 I’ll keep an eye out for that book! BB, this is a phenomenal post! Well done! Damn, I wish I could do these! So many thoughts. First, where do you stand, out of curiosity, on the Haber = the best issue? What are thoughts on the post hoc morality behind his work? I wonder if we can simply use aphorisms and cliches to explain away (justify) our excesses? Haber knew what he was doing, but did he cogently aim to build ammonia to build chemical weapons and explosives, or did coincidence or fate allow his work as a chemist to meet his desire as a patriot? And what can we infer from that? Can we judge people for their actions when we have no idea of their motives, both from a historic perspective, and also a cultural one? We are (as educated Westerners in C21) incapable of imagining what it was like to grow up knowing…*knowing* war was inevitable all the time. Can we blame Haber for seeming inhuman and inhumane to us when his world and actions were archetypical? Great post, BB! I wonder if it is easier to see this guy as “evil” because he wasn’t on our side? I think Tiddles makes a good point about context being really important when we try to look back on these times. It is easy for me to see the downsides in this situation, but I’m not sure it is fair that I apply my own reference frame retrospectively. That being said, I personally think that scientist should try to consider how their work might be misused, in addition to potential beneficial applications. I don’t think that we should avoid doing research because of potential misuses, but it can’t hurt to have considered both the pros and cons going forward. I would add that, more to the point of your post maybe, that I think “greatness” is in the eye of the beholder. I have a hard time with forgiving (my perceived) transgressions when trying to decide if this guy should get the label. I don’t know if it would be different if he had chanced his tune after the fact, but I am really troubled by his focus on chemical warfare. The line between toxin and drug is surprisingly thin. First I’d like to second @Namnezia on the Alchemy of Air. It’s a really great book. It presumes to give some insights into Haber’s frame of mind during the search for a way to create ammonia from its elements (a true philosopher’s stone). Haber had been a second tier scientist. He couldn’t get a coveted major research position. Many others of that time were also trying to figure out this chemistry. Some of the major players were Ostwald and Lavoisier. Also, the president of the Royal Society (in the late 1800s) had said that developing artificial fertilizer was one of the greatest callings for scientists. So Haber had company. His drive to prove himself led him to succeed. His nationalism led to the fringes. The whole Haber story is really quite tragic. Born a Jew, he converted so that he could find better work and because he was nationalist. His inventions (and chemical warfare) brought a country to power. And that country eventually tried to eradicate those of his background. Two other things that I find really interesting in this story. 1) The work of Le Riossignol to INVENT and BUILD all of the high pressure apparatuses is astounding. 2) The way Mittasch tested catalysts was groundbreaking. And I don’t know that we’re any better off today than Mittasch was then when it comes to predicting good solid state catalysts. This is an awesome post, Belle!! I really enjoyed it. Excellent points, Gerty, Tideliar, and Matt! With regard to the “post hoc morality”: I give the benefit of the doubt that his efforts to synthesize ammonia were for the benefit of mankind–or at the very least, having a supply to make explosives was not the driving motive. When it comes to chemical weapons, it’s whole other ball of wax. Haber knew precisely what he was advocating, recognized the psychological effect of this approach. He introduced the tactic of first shelling with irritants that forced soldiers to remove gas masks, then following with poisonous gas. He used his political connections to push the founding of an Institute of Chemical Warfare. But it was a different era, different circumstances, as Tideliar points out. And it’s impossible to know what we might do when placed in that situation. As reprehensible as his actions might seem to us today, Haber seemed to believe that they would bring an early end to the war, and thus save more lives in the long run. Gerty highlights that our perspectives are likely influenced by political affiliation. Winston Churchill (or Gowron, depending on your frame of reference ;)) said, “History is written by the victors.” And the victors tend to sanitize or justify their own actions, even when attacking similar tactics of the enemy. Thanks for the incredibly thoughtful and thought-provoking comments thus far! In a similar vein to this discussion, you might be interested in Copenhagen, originally a play that was adapted for TV by Michael Frayn and produced by BBC. Pieced together from history and personal documents with a bit of creative license, it revisits a meeting between Bohr and Heisenberg, once colleagues, now on opposite sides of the war in 1941. It brings in many of the same issues raised here about how we–and ultimately history–judge the actions of scientists, especially in times of war. It’s definitely worth adding to your Netflix queue. As Gerty-Z says we need to think about the application of our actions. In a shorter reference point this is why we, as scientists, do have/should have a vaulted position in society and need to learn to communicate better. This is vital. Secondly, Gerty-Z’s point leads to a discussion of the current anti-vaccination movement by bringing up the history of our science. It’s not just Haber and his links to chemical warfare, or Oppenheimer et al. and The Bomb. But what about the horrors forced upon domestic civilians in the name of biological research… the small pox vaccination (Jenner?) and testing cow pox puss on the farmhands first, through to Offit’s brilliant “Vaccinated”, a history of modern vaccine research. Where his protagonist, Maurice Hilleman, who did more to save lives than many have ever tried, admits to testing unlicensed Hep B vaccines on mentally retarded children in the 50s. Who are we to judge and how are we to judge? There is certainly a long line of examples of behavior/actions by scientists that would not go unquestioned in today’s world. A point you made earlier, Tideliar, is that we live in a very different age. The public at large is, to an extent, more aware of what we in science are up to. We live in an age when people demand to know what’s happening behind closed doors. People are inclined to latch on to sensational details and go hunting “witches” (maybe it’s not so different after all). There is a certain level of skepticism, even distrust, it seems, toward science. For decades, scientists have been oft portrayed in popular culture as cold, calculating individuals, so focused and driven to complete their work that they ignore the dangers and morality of it. I can’t help but wonder if it’s portraits of those like Haber that set the stage. We are left to wonder whether Jenner, Hilleman, and others truly understood the risks to their test subjects, or if they were so utterly confident in the outcome, they they considered the risks negligible. I also wonder if the socio-economic and other factors (e.g. mental illness, prisoners) contributed to creating a barrier between these researchers and their subjects that, in their minds, made it more acceptable, an instance of some being more equal than others. Or perhaps they weighed the risks vs. potential benefits and decided that “the needs of the many outweigh the needs of the one or the few”. With our frame of reference, we readily see the moral quandaries of scientists past, but what of our own? In another century or two, will scientists look back on some of our means and question the ethics of our work? No doubt these questions have haunted many generations before us and will plague many to follow, not only in science but in other arenas as well. Yet it is our responsibility to examine history, learn from it, and adapt. There exists the possiblity-however infintesimal-that one day, some of us will be faced with a substantial ethical dilemma associated with our work. There may come a point when (if I may quote Jean-Luc Picard out of context) we must say, “The line must be drawn here! This far and no further!” Discussing, even judging, how great contributors such as Haber and Jenner stumbled upon discoveries and used their intellect is one of the few ways we have to explore the boundaries of our own morality, to decide where that line must be drawn. They also provide cautionary tales of how even the brightest minds can fall into trap of searching for the answer they want to find, rather than the answer the data yield. Would that it was so simple. Take “dark matter” in astrophysics. Is the data indicating “dark matter”? Or that the current theory of gravity is wrong on galactic scales? Moti Milgrom who started arguing for the second alternative in 1983 can only have been sustained in his fairly lonely campaign by the conviction that he is right, despite endless vilification by the astrophysics establishment following a different conviction (equally “unsupported by the data”). You raise a wonderful point that conviction is a double-edged sword. Scientific innovation would likely die without such conviction, as many of the most important concepts in all fields were oft proposed with insufficient supporting data and initially rejected the community at large. Perhaps it was related to his greatest failing, his vanity. When anybody contradicted Einstein, he thought it over, and if he found he was wrong, he was delighted, because he felt he had escaped from an error, and that he now knew better than before, but Pauling would never admit that he might have been wrong. Regarding the general issue of “greatness” I think there are several ways to go about it. When I think about my field I tend to come up with two types of scientists. Those who did fundamental experiments, often way before any one else was doing anything similar. Those who had strong theoretical influence for a time, even if they were eventually eclipsed or proved wrong. I get the feeling that the theorist tend loom larger. Superb post — posts like this represent the best of what science blogging can be. It’s fact-based, reflective, full of context and stimulating of discussion. I’m surprised that the discussion of the “negatives” of Haber’s legacy focuses only on armaments. There are several other major downsides to the easy fixation of atmospheric nitrogen, including: (1) increased nutrient pollution due to nitrogen fertilizer — runoff washes this nutrient into waterways where algal blooms trigger eutrophication, (2) increased nitrous oxide air pollution — with consequences ranging from acid rain to global warming to deleterious health effects, and finally (3) overpopulation of the human species. More than anyone else, Haber is responsible for increasing the human carrying capacity of Earth. Though laudable in decreasing hunger and suffering among many members of our own species, a less desirable side effect is intensification of every environmental problem with an anthropogenic cause. Deforestation, soil degradation, pollution, resource depletion, climate change, loss of biodiversity, and ozone depletion are a handful of examples of major, far-reaching issues that stem from a simple source: too many people. We’re going to cross the “7 billion” milestone in human population later this year, and as you point out above, “almost half the world’s population was sustained by agriculture dependent on fertilizer made from Haber’s ammonia.” Every person on Earth contributes to some degree to the sum total of environmental stress on the biosphere. Haber should “get credit” for bringing about these consequences as well, in my opinion. Great point, Callan, and thanks for taking the time to include the great links! I chose to focus on the war era contributions of Haber, but you’re quite right to point out the environmental issues associated with Haber’s nitrogen, likely unforseen at the time. The Nature Geoscience feature I linked actually highlights this aspect, as does Leigh Boerner in her witty and well-written post on the chemistry and impact of the Haber-Bosch process. Interesting, rpg. It seems there is a great deal of tragic irony surrounding the story. Very interesting. I had no idea that Haber was involved in the Nazi war effort. I suppose most people focus on his most famous process and leave it at that. It is hard to decide whether his contribution to science was beneficial or not – saving millions of lives from starvation or causing death on the battlefield. Haber was recently named a ‘Chemical Engineer who changed the world’ by The Chemical Engineer (TCE) magazine. He did change the world, and in more ways than one! Russ, thanks for stopping by. Haber’s personal and scientific history is deep and complex. His predominant, direct contributions were to the Central Powers, and even then really to Germany, during WWI. He did continue his work on chemical weapons after the war. That research was halted by Allied inspectors in 1919, and he turned his efforts to pesticides. He still advised the German government in chemical warfare up until 1933, when he was dismissed from service because he was Jewish born. He died in Switzerland less than a year later from, as rpg notes, a heart attack. He would never know that one of the chemicals he developed for agricultural purposes, Zyklon B, would be used against his compatriots in Auschwitz and Oranienburg. Great post BB! It’s taken a while for me to get around to reading it, but what an interesting read!! I’m truly conflicted about the idea of Haber’s “greatness”. In a similar vein, I understand that some important medical discoveries were made in the Nazi concentration camps. It’s truly difficult to know how to react to the research when the basis for the work was meant for so much evil. Definite food for thought, but I’m not sure there’s a gratifying answer when looking at these issues through a morality lens. I completely understand the conflicted feelings. That was really the impetus for the post. I agree that there may be no gratifying answer, and I think that’s perhaps how it should be. I’m very late to the party but this is a very interesting post and discussion. I am particularly intrigued by Pertutz’s ‘what if’ regarding the impact of Haber’s work. Of course we’ll never know. The dilemma on greatness is a tough one – but it’s good to have an explanation of the historical context of Haber’s discovery and his flawed humanity. Forgive me a diversion, but this post reminded me of a comment made by Richard Hamming in a talk on scientific greatness, which suggests that the connection between war and science can also go the other way. (I mentioned this in a blog post I wrote a couple of years back.) Hamming’s point was that the success of the Manhattan project gave a strong sense of self-confidence to a generation of scientists who went on to do truly great work after the war. In a similar vein as your diversion, there is a peculiar link between war and scientific progress, as noted by daGA on Twitter. The strong sense of confidence was driven in part by success, which was in turn driven by a unique sense of urgency that I suspect few scientists today feel. I’ve been reading, bit by bit, Science, the Endless Frontier, which was a 1945 report from Vannevar Bush, Director of the Office of Scientific Research & Development. It summarizes the findings and recommendations of a committee in response to a letter from Roosevelt to Bush. Its work has been conducted in the utmost secrecy and carried on without public recognition of any kind; but its tangible results can be found in the communiques coming in from the battlefronts all over the world. Some day the full story of its achievements can be told. There is, however, no reason why the lessons to be found in this experiment cannot be profitably employed in times of peace. Perhaps the challenge today lies in capturing that boldness and drive in the current culture and climate. Great post, I used this for my FameLab Final (and got told off for History not being Science), and I do it as a talk around the country. Recommend the ‘The Alchemy of Air’ though you seem to have covered most of it. Annoyingly I titled my talk ‘Alchemy and Air’ before I knew of the book. Given that they were founded by a man at least partially out of guilt for his invention of a military explosive compound (dynamite), I’d say a Nobel Prize for Haber was entirely fitting :). Alfred Nobel is probably a interesting comparison with Haber in that regard actually; both made a discovery with strong military and civilian applications, yet one gets a much better rep than the other. Is it because Nobel showed regret for the military applications of his invention? Because Haber continued into chemical warfare? Or is it just because no scientist wants to indirectly cast aspersions on the most prestigious award in science by attacking its creator? Honestly attacking people for making weapons of war alone is kind of wrongheaded. First off, can you really see condemning everybody working at, say, Colt or Lockhead or any other weapons manufacturing company? I can’t see inventing something with military use as being THAT much more morally culpable than making or especially using said thing. Second, motivation is important here. Doesn’t seem like Haber was out to gleefully slaughter as many as he could; the read I get here was more along the lines of “make a weapon so deadly the enemy will back off”, which to a certain extent was kind of the same logic behind the atomic bomb. And it’s not like he handed it off expecting said gleeful slaughter either; Germany wasn’t to my knowledge deliberately attacking civilians with the stuff, and in fact weren’t even the first to use gas warfare (the Allies being quite happy to use the stuff themselves). Finally, anticipating what military applications an invention might have can be tricky at best. Penicillin got quite a bit of attention when invented because of its value in keeping soldiers alive, but I’d say overall it’s saved far more lives than it’s indirectly taken that way. Hi, Mike – thanks for dropping by. I don’t think anyone is really attacking Haber per se. And regarding Alfred Nobel’s contributions to war, there’s at least one article linked on the Nobel Prize site on this aspect. I think that the comments here and elsewhere reflect that this is a complex question leaving many with conflicted feelings. It doesn’t mean we shouldn’t talk about it, though. And I would even argue that such debates are important for the scientific community and for the public perception of it. They make us think about our own boundaries, and they show that we’re not the cold, purely analytical, amoral caricatures that are sometimes (to often) portrayed in popular culture. Just to add something. The French used Gas warfare before Haber in WW1, though tear gas not chlorine. Also Haber believe he wasn’t breaking the Hague convention as he wasn’t shelling gas, rather releasing it from canisters. The references I’ve read suggest it was a misguided attempt to end the war quicker and save lives. The sad irony is the later work into chemical warfare under the guise of ‘pesticides’ were used by the Nazi to exterminate the Jews. The later part of Haber’s life generally tragic, again as everyone has mentioned it’s covered in ‘The Alchemy of Air’. I agree with your assessment that Haber believed he was working for the ‘greater good’, Andrew. When we look at much of the – shall we say, questionable? – research and development that has occurred not just during wartime but throughout history, we often encounter evidence that the practitioners considered the human cost justifiable… To borrow a turn of phrase, “The needs of the many outweigh the needs of the few or the one.” Yet one person’s logic may be madness to another. Hi, great article and really interesting to read the comments! I’ve been considering similar moral issues reading about pesticide production by Bayer, particularly their prior incarnation as part of IG Faber. Currently, some might see Bayer bastards in the ecological world because of the alledged role of some of their pesticides in sudden bee death/CCD. They do have pedigree in wider bastardry though – executives of IG Faber during WWII who were indicted at Nuremburg. Some were released early, and restrictions allowing them to control companies were lifted. In some cases they almost moved right back into their old jobs. It’s made me think about how I judge a company to be (un)ethical. Putting aside the pesticide issue, is it fair to see Bayers current sons as guilty of the sins of their fathers? Does the lack of remorse implied by reinstating their old directors suggest their morals continue to be flexible? How do the actions of a few directors colour the ethics of a whole company? It’s a complicated issue. Hi, Neuromancy! Thanks for the comment (and sorry I took so long to respond). I suspect that if we look beyond the shiny brochures, most companies have some questionable dealings of the past-and possibly present. Sorry to be late to the party on this post. As the author of “The Alchemy of Air” as well as a biography of Pauling, I’m delighted (and surprised) to see the two of them linked in the same blog entry. A couple of thoughts: First, don’t think that Pauling’s Vitamin C work was nothing more than a late-life folly — it grew logically out of his enormous body of work in chemistry, biology, and medicine, and helped spur today’s enormous interest in the effects of micronutrients on human health. Pauling was motivated in great part by altruism and a desire to lessen human suffering. Haber, interestingly, was in this way Pauling’s polar opposite, driven more by a desire for position, power, and respect. Thomas, thanks very much for bringing your perspective! It’s fascinating how these two great chemists represent the opposite ends of the spectrum for science in society: the hunger for power that causes some to scorn science, and the hunger to help in which many place their hope. I would like to know if there are any memorials to Fritz Haber, plaques, statues, buildings, sculptures or a gravesite. Thanks. Certainly Yes! You can check it on google lol he has a Nobel Prize which a you can fully read in wiki [redacted]. bb: Comments (on my posts at least) are intended to promote discussion. There’s no reason to be insulting. My reaction was the same as gerty-z (above) that greatness is in the eye of the beholder. Of course Haber made a huge contribution that led to remarkable successes. Often however great scientists have no idea that their fundamental work will lead to benefits to us humans, and why should it? For example the discovery of NMR by Purcell, Pound, Bloch was done without any expectations of applications. 1948 idea: “Can we make the magnetic moment of a proton resonate?” They had no idea of chemical shifts, multidimensional NMR and MRI. They just did pure science which turned out to have great applications. (Wrote a blog on meeting Bloch who confirmed this to me: http://bit.ly/nBCXm3 .). What would have happened to Linus Pauling had vitamin C been a great panacea? Was the work of Alfred Nobel great? Often greatness is a result of an idea that comes at an opportune time for R&D, but a lot of great science is great even though it has absolutely no applications at the present time. I think that Hall’s discovery of the catalyst cryolite should also be ranked as great, if greatness is defined by industrial success. But was Hall a great scientist for this, especially since his career was cut short. I enjoyed the blog and learned a lot about Haber. Thanks for stopping by and sharing your thoughts, Bryan! Your point regarding the timing of discovery and defining greatness is intriguing. I hadn’t considered it, but perhaps in some ways, ‘greatness’ is recognizing an opportunity and striking while the iron is hot. and insightful! In the present day world that’s tough to do. trying to sell me some overpriced magazines. home. Whereas, when it is not done so, the amount depends upon your income profile and repaying capability.